SAS and Hadoop are natural partners. Hadoop provides distributed storage and processing power. SAS treats Hadoop as just another data source and complements it with data management, data discovery and advanced analytics. 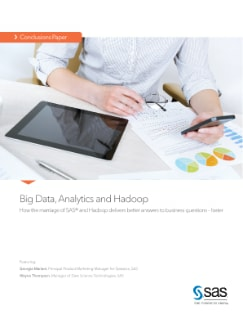 This conclusions paper highlights two ways you can work with Hadoop data from within a familiar and interactive SAS Analytics environment – either with the graphical user interface of SAS® Visual Statistics or streamlined programming via SAS In-Memory Statistics for Hadoop.